Western intervention in Syria will do more harm than good. Kevin Ovenden, The Guardian, 170212. Submitted by Jim_Roche1252 on Sun, 19/02/2012 - 13:03. 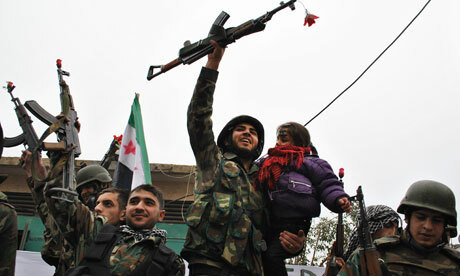 Calls for aggressive intervention in Syria are growing as the country slides further into sectarian civil war. The shrillest are from the Republican right, joined this week by Israel's foreign minister Avigdor Lieberman. The same people are campaigning for confrontation with Iran, threatening a major war. Elliot Abrams, a neoconservative architect of the Iraq disaster, spells out the connection: Syria, he says, provides a "proxy opportunity" to heat up the cold war with Tehran. Regime change and ensuring that the Arab spring yields only the wizened fruit of governments as accommodating as Saudi Arabia cannot be sold on their own terms. Instead they are wrapped in the rhetoric of humanitarian intervention, tapping the sentiments of those genuinely moved by the suffering in Syria. We've been here before. The war in Libya was purportedly to save lives. In fact, the killing intensified on all sides, including from Nato bombs. Estimates of the number dead reach 30,000. The outcome is not democracy and human rights. Amnesty International is the latest NGO to report the torturing to death of prisoners under the new regime and rival militias. The town of Tawergha, home to 30,000 largely black Africans, has been virtually wiped off the map. But the cameras have moved on, just as they did more than a decade ago following Nato's bombardment of Serbia and Kosovo. That, too, was supposed to save lives: the death toll spiralled; after the victory came ethnic cleansing in reverse. That "ethical" war, which lacked the fig leaf of a UN security council resolution, presaged more to come. It lowered the threshold for the invasion and occupation of Iraq, by way of ongoing war in Afghanistan. Negotiation and a political settlement with the Taliban in 2001 were impossible, we were told. They were uniquely diabolical, closed to reason and killed their own people. Now, after tens of thousands dead, there are talks – in Qatar, where the Taliban have an office not far from the US's Centcom headquarters. The Russian and Chinese veto of a regime change resolution over Syria at the security council has left western leaders exploring other options to the Libya model. But all of them rule out any political settlement between the government and armed opposition in Syria and are designed to ratchet up the conflict and tension in the wider region. The "humanitarian corridors" proposed by French foreign minister Alain Juppé would mean troops on the ground. The kleptocratic Gulf Co-operation Council's proposal says everything about how hollow is the professed concern for the Syrian people and progress in the Arab region. Saudi Arabia and Bahrain are posing as friends of a democratic Syria while shooting down their own pro-democracy protesters. The Gulf states are already reported to be funding sections of the Syrian opposition and are trying to cohere it under a leadership that will be congruent with their western allies. With Saudi largesse comes sectarian poison designed to pit Sunni Muslims against Shia, and especially against Iran, which is singled out along with China in the Pentagon's latest doctrine as an obstacle to "securing US global leadership in the 21st century". As for covert operations, they are already under way – against nuclear scientists in Iran, bringing us closer to war. We strongly oppose, rather than defend Assad's actions. But the solution is not more intervention in the Middle East. British arms sales to Bahrain continued during the suppression of the democracy movement. The US is selling $60bn of warplanes to Saudi Arabia. The Stop the War Coalition has argued consistently to reverse this cynical and corrupt policy. Doing so would truly contribute to progress in the Middle East. In Tahrir Square western allies cleaved to Mubarak until the 11th hour and protesters still face US-supplied weapons. People across the Arab region are struggling to throw off decades of foreign interference and domestic dictatorship. We should do what we can to stop our country subsuming them again in a great game which is heading towards further war.